Tom Mottershead was at the time a Sgt. Pilot with 25 Squadron RFC. He was making a reconnaissance of an enemy airfield. He was flying a FE2. The other FE2 on the patrol was piloted by Sgt. Sidney Attwater. They had both made a pact to stick by each other in action no matter what happened. 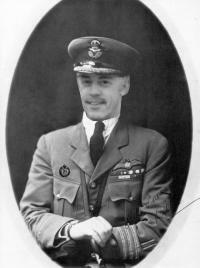 Attwater states that he saw Mottershead gesticulating for them to lose height over the enemy aerodrome. It was only when they descended through 500 feet that Attwater realised that Mottershead intended to land on the airfield. Mottershead landed first and his observer opened fire on the hangers. Attwwater landed and his observer followed suit. Mottershead indicated to Attwater that it was time to leave and both took off. Well, that's a strange and dangerous way to attack an airfield! I wonder if it would work in WOFF? Last edited by JimAttrill; 03/28/15 11:55 AM. It's hard to believe that the defensive machine guns around the base wouldn't have shredded them while they were stationary, and what about the other personnel that would normally come out to see what the engine noise was about. Did they do this late at night or very early in the morning before people were up and about?